The slideshow of paintings on this page are selected works that have been "SOLD" to private parties as well as corporate offices. If you see a painting and would like to commission a special piece similar to one of these, go to commissioned paintings under Purchasing My Art page for more details. Giclees, prints, ceramic tiles and Fine Art Miniatures are available directly from the artist are listed in the Prints Tab. 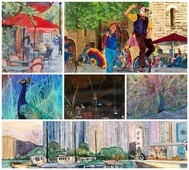 The selected images below are printed from my original watercolor paintings which have been sold or are no longer available. The blank cards come in various sizes to best fit the original painting dimensions (see in images below: 5 x 7, 5 3/4 x 5 3/4, 5 3/4 x 4 1/4, 4 3/4 x 4 3/4, 6 x 4 1/4 and 8 ½ x 3 ½). They are printed on card stock as well as acid-free watercolor card stock which makes them suitable for framing or giving. The price includes an envelope and a protective sleeve. These are some of the most popular cards purchased. 5 3/4 x 5 3/4 Greeting Card with envelope. Printed from original watercolor, gouache painting. My sister-in-law has been monitoring the coral reefs due to this year's warm water temperatures and the effects on the coral reefs. 5 x 7 Greeting Card w/envelope printed from an original watercolor painting which has personal importance to me because it is my husband has been a member of Bridge City Jazz and they played at an event at the Lawrence Gallery. What a wonderful photo to get with all the wonderful angles of the piano and colors. FREE SHIPPING within the United States. I used Dr. Ph. Martin Hydrus Watercolors as well as Daniel Smith duotones and iridescent watercolors and the surface was Yupo. Continuing my series of Peacocks, I'm very interested in the detail of the head and the crown, particularly the eyes of the peacocks. The colors are always so beautiful that I can't resist painting. Paintings done on Yupo stay true from the first application. This one gave me the opportunity to add my vision to what I saw in many different photos we have taken. I would like to thank Dr. Robert Wagner for recent purchases for his new office building. I was working with his wife, Refinement, in making the selections for several of the office spaces. I have provided a link on the photo to the right to their offices. He has been our dentist for many years. I would like to thank Beth Archibald for her recent purchases for the Archibald Relocation office in Lake Oswego. 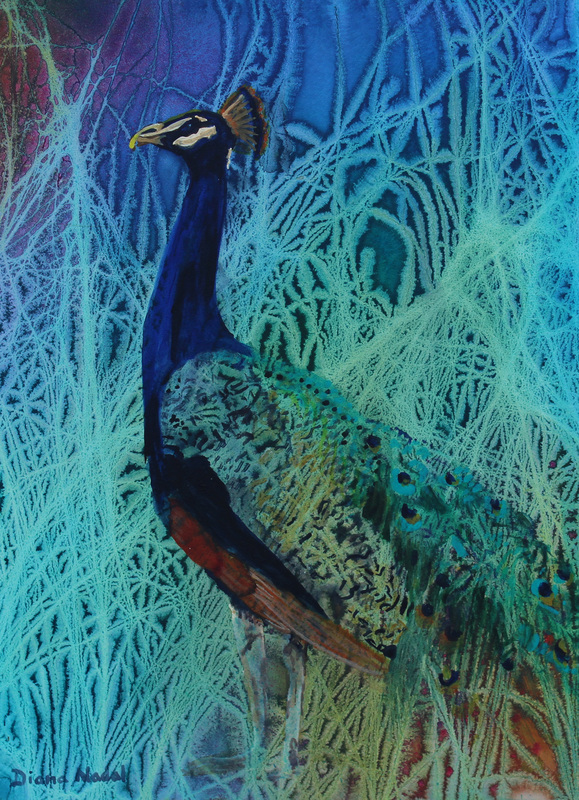 I hope you will visit her website by clicking on the photo of the paintings which she purchased. Beth hung paintings in each of her inner offices over the summer. This is an option for other businesses when walls could be filled with art.